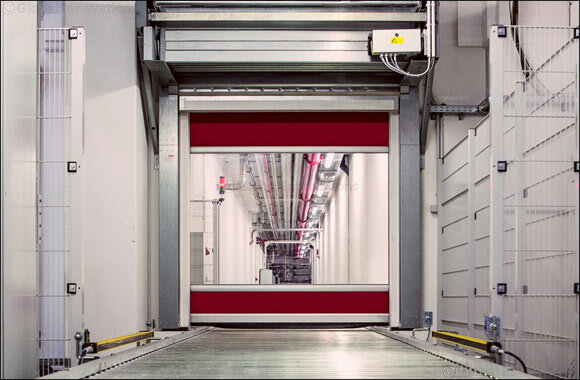 Dubai, UAE; June 13,2018: Hormann has introduced door Type V3009, a high-speed roller door with a flexible curtain, designed for a high number of automated opening and closing cycles. It can be fitted between the operating sections and the storage areas within a conveyor system. Due to the low lateral space requirements, this door is specifically designed for integration in conveyor systems and their frequent automated opening and closing cycles. The door control can be integrated in existing PLC systems. A volt-free contact reports the door position (open / closed) to the control. The opening speed is 0.8 m/s and closing time is 0.8 m/s. The door uses aluminium curtains, available in a variety of colours including zinc yellow, pure orange, carmine red, gentian blue and agate grey.